Freedoms that are worth the money! Open source software (OSS) has long been growing beyond the Linux operating system and is gaining ground in more and more areas. Often, however, the rights and obligations associated with the predicate open source are forgotten. This article is intended to trace the history of OSS and, inseparably linked, describe the evolution and impact of the GNU General Public License (GPL). Free software is not the invention of a few gurus and hackers, but software was considered free even in the early days of computerization in the sixties. At that time it was self-evident that a second or third did not have to re-develop an existing algorithm. Developers have passed on the source code without any conditions. The software was released by people and companies like Bill Gates or especially AT & T in America. They had realized that a mental idea - in our case the software - could be multiplied cost-effectively and distributed more cheaply. Also in 1983 Stallmann launched his GNU project with the goal of developing a free operating system. GNU is a recursive acronym ("GNU's not Unix"), which indicates both the similarity with UNIX and the delimitation to non-free UNIX systems. In 1985 another milestone was the founding of the Free Software Foundation (FSF), the guardian of the later GPL. Together with Jerry Cohen Stallmann published in January 1989 version 1 of the GPL, probably the most famous license for Free Software. 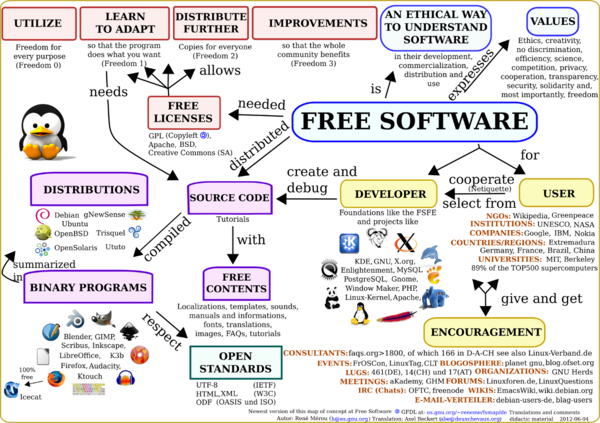 The graphic below illustrates the concept of Free Software in an impressive way. The GPL does not charge royalties, does not restrict rights and explicitly permits retransmission. However, this happens under one condition: If a developer has decided to publish under the GPL, that is final for subsequent versions as well. A program under the GPL can not become proprietary. GPL and thus OSS thus correspond to a virus that always propagates and distributes independently. In terms of freedom, you can call it "Virus of Freedom". OSS assumes that anyone can freely use and pass on intellectual property. Thus, the GPL brought problems for proprietary software, which wanted to access the popular free libraries. Especially for this purpose in 1991 the "Library General Public License" (LGPL), also known under the name "Lesser GPL", created. Due to the LGPL, the program accessing the library could be subject to a different license model, making OSS and GPL compatible with non-free systems. So far, there has been talk of Free Software, but the buzzword is open source software. And catchword is the right term, because the term "open source" achieves a greater marketing effect. As early as 1998, many Free Software developers were debating whether this should be called "Free Software". In Germany, the term "Free Software" is associated with what is meant to be expressed in the definition of the FSF. In English, however, the term "free" means two things: free and free. But OSS is by no means free. Free download incurs costs, even if they are low on a DSL flatrate. Behind the software are mostly voluntary work of developers or projects of clients who can pursue quite commercial interests. One could not and did not want to agree on "Free Software". In order to market Free Software as business-minded and less loaded with ideologies, Christine Peterson of the Foresight Institute designed the term "Open Source", because "open" implies in English what we mean by "free" in Germany. In addition, the term refers to the exposure of the source code and allowed for easier marketing. Because obviously people have a prejudice to "free" - according to the motto: something that costs nothing, can not be good quality. Eric S. Raymond, Bruce Perens and Tim O'Reilly saw that as well. Finally, Open Source became the namesake of Raymond, Perens and O'Reilly's Open Source Initiative (OSI). OSS differs in essential points from proprietary software, not only in terms of free availability as a program and source code. Also, the selection of different license models and the bankruptcy protection offer advantages over commercial software. Safety is higher and development costs are lower. With commercial software, the customer is always in danger that a manufacturer can go bankrupt and a program is no longer developed or supported. OSS does not know this problem. If the developer of an OSS disappears, others can take on and develop the project. This happened in 1998 at Netscape, which released the source code for Netscape Navigator due to the dominance of Microsoft in the browser market. The project Netscape continues today as a Mozilla project and enjoys great popularity as a Firefox browser. The development costs are not borne by a company or a developer, but they are distributed worldwide to several hundreds in the corresponding projects. They are passionate about programming in their spare time or are part of OSS projects that were initiated by a company specializing in custom software and subsequently developed under the GPL. The companies also benefit from this, because in this way they get back more power. The software is extended by orders for modules and improved in operation. Another important aspect of OSS is the "process-oriented software development", in which customers are involved in the production. They control significantly the later functions and the usability of the program. A commercial software developer, on the other hand, first looks at what they can sell for profit and then develops the software. Security with OSS is achieved through the high quality level of the large developer and tester networks as well as the high security level of the peer reviews. Thus, sources of danger are usually detected relatively quickly and promptly resolved by specialists. In principle, the OSS licenses distinguish between two models: non-copyleft licenses and copyleft licenses. Non-copyleft licenses are strongly based on the BSD License (Berkeley Software Distribution). They are less consistent in terms of their sublicensing than copyleft licenses. Software placed under it is easier to integrate into proprietary software. An example is the "X11 / XFree License", which makes no information about a sublicensing and implicitly allows it. As a result, both OSS and proprietary versions of the X Window System exist. Further developments can be carried out under another open source license, even proprietary distribution is possible. For example, software under a non-copyleft license may become unfree. Most of these are disclaimers and copyright notices, but there are no obligations as with the GPL. The most important representatives of non-copyleft licenses are the "Apache Software License" and the "OpenLDAP Public License" in addition to the BSD licenses. "Copyleft" was an allusion to copyright by Richard Stallmann. If an author lawfully manipulates the copyrighted work of another, then, under applicable jurisdiction, he will have a say in deciding how the treatment may be used. If the original work was freely copyable, redistributable and changeable for everyone until then, then these freedoms are not automatically transferred to the editing. This principle is trying to reverse copyleft licenses. Since the original author also has a say in the editing, he only allows the processing to be shared if they are licensed to the same extent to everyone. In short, the copyleft process is designed to prevent Free Software from becoming the source of scarce proprietary software. Interesting is the issue of liability in GPL software. Basically, the author of free software as well as the owner of proprietary software. Thus, a developer can be sued at his home for any damage caused by the use of his software. In fact, even proprietary software has never happened in the last 20 years. Perhaps this has to do with the expectations of users that software is fundamentally flawed and no customer expects freedom from errors. In any case, a liability claim would scarcely be possible with the large number of developers of a program, since they are at home across the globe in different states. One would first have to find the person responsible for the faulty code snippet in order then to sue him in the respective country for valid law there. In practice, this is not feasible and therefore the issue of liability for GPL software for authors is not a relevant problem. Quite different if the licensee does not abide by the rules of the GPL. In 1999, Professor Victor Yodaiken was forced to grant Open Source RTLinux (US Patent 5,995,745) an Open Source RTLinux Patent License 2 license due to the pressure of the FSF. By analogy, the patent with this license may only be used by programs that are also subject to the GPL, but not by any other licensed OSS . Yodaiken hatte den Kernel unter Debian GNU Linux verwendet, um ihn mit einem Echtzeit-Interrupt-Handling zu erweitern. Allerdings unterlag der Linux-Kernel der GPL und daraus folgte, dass die gesamte Entwicklung der GPL unterliegt. Der „Virus of Freedom“ hatte gegriffen. Yodaiken hatte versucht, die Patent-Lizenz zu verwenden, um restriktive Bedingungen auf ein unter der GPL stehendes Betriebssystem anzuwenden. Das OSS-Prinzip geht streckenweise sogar so weit, dass Software, die mit GPL-Werkzeugen entwickelt oder kompiliert wurde (z. B. mit gcc), bereits zu OSS wird.In the second spectacular case, on May 19, 2004, the Regional Court Munich I ruled as the first court worldwide for the legal validity of an open source license, in this case the GPL. The procedure was preceded by a preliminary injunction of the Berlin software developer Harald Welte against a router manufacturer. Harald Welte is chairman of the Netfilter Core team, which develops the "netfilter / iptables"  program, which is part of the Linux kernel security system. On the websites of the developers the program is available for free download with the explicit reference to Free Software and the GNU / GPL. The defendant company offered their company software, which in the meantime included the GPL program "netfilter / iptables", also for download. However, there was no indication that parts of the software are under the GPL license. Nor was a copy of the source code made available to the public. After unsuccessful warnings of the plaintiff, the legal action against the router manufacturer showed success by the LG Munich I granted a cease and desist claim from §§97, 69a, 8 paragraph 2, 15 UrhG and ruled that the actions of the defendant company against the content violated the GPL license. The court held that the granting of rights of use by the GPL can not be regarded as a waiver of copyright and copyright positions. Instead, the licensors exploit the opportunities in copyright law to ensure the distribution and development of software. In principle, according to the judges, the GPL complies with the construct of General Terms and Conditions. They are therefore subject to the control of §§ 305 ff BGB. For the first time, the judgment provided legal proof that the GPL complies with German law. The court ruling is published on the internet . OSS providers must always specify the license used. In order to avoid copyright claims by the co-authors of OSS, the person concerned should align their distribution chain with the GPL. It must be ensured that the partially different license requirements are fulfilled when passing on the source code. Here comes the "Virus of Freedom" again: Once GPL, always GPL. The fact that the idea and the idea of ​​the GNU GPL carry more and more fruit are shown by numerous other free licenses, which are adapted to the respective requirements and extend the license spectrum. Examples include the GNU Free Documentation License (GFDL) or the Creative Commons licenses. Meanwhile, the range of different licenses is so large that it is difficult not to lose track or get tangled up in legal details. Especially in view of the fact that OSS is increasingly being used in commercial solutions, developers and providers should be careful not to violate the basic licensing rights.